The United States Army's 7th Infantry Division was first activated in 1917 during WWI and was designated as a Light Infantry unit. It consisted of three brigades; the 1st, 2nd, and 3rd. For most of its history, the 7th was stationed at Ft. Ord, California. The 7th is best known for its service during WWII in the Pacific Theater, to include the Aleutian Islands, Leyte, and Okinawa. After WWII the 7th was stationed in Japan and Korea. When the Korean War broke out in 1950 the 7th found itself to be one of the first units to see action, partaking in the Inchon Landings, and advancing north until stopped by the Chinese forces. The 7th saw battle at Pork Chop Hill and the Battle of Old Baldy. The 7th returned to the United States after the Korean War, seeing action again this time in Honduras and Panama. The 7th also served by providing support to civil authorities during the 1992 Los Angeles Riots. The divisions final tasking was as a training and evaluation unit for the Army National Guard Brigades. The 7th was deactivated in August of 2006. Elements of the 7th Infantry Division participated in the amphibious assault on Attu Island, located at the extreme western-end of the Aleutian islands chain, on the 11th of May, 1943. This assault was lead by the 17th Infantry Regiment. On the 29th of May, 1943, the Battle of Attu was finally over after a failed suicidal counter attack by the remaining Japanese forces stationed on Attu. During this battle 600 of the 7th's soldiers were killed, while they killed 2,351 Japanese and took 28 prisoners. After the Aleutian island chain was secured, the 159th Infantry Regiment was ordered to stay on Attu, with the 184th Infantry Regiment being assigned as the 7th Infantry Division's 3rd Infantry Regiment. The 184th remained assigned to the 7th for the remainder of the war. The 159th stayed on Attu for a period of time, eventually returning back to the United States where it remained until war's end. The final battle to secure the Aleutian islands took place on Kiska. In August of 1943 elements of the 7th Infantry Division participated in yet another amphibious assault, this time on Kiska, along with the 6th Canadian Infantry Division. The allied forces found Kiska to be deserted, later discovering that some 5,000 Japanese soldiers were withdrawn during the night of 28 July, 1943, under the cover of fog. Nevertheless, some 100 participants in this attack were killed by friendly fire. The 7th Infantry Division returned to Hawaii for additional amphibious assault training along with some R&R. The Division was then assigned to V Amphibious Corp under command of the U. S. Marines. They left Pearl Harbor on the 22nd of January, 1944, eventually landing on islands in the Kwajalein Atoll along with the 4th Marine Division. After securing 47 islands in the atoll, and having suffered an additional 176 killed and 767 wounded, the 7th returned to Schofield Barracks, Hawaii, in February of 1944. The 7th Infantry Division left Hawaii once again on October 11th, 1944 heading for Leyte while assigned to the XXIV Corps of the 6th United States Army. On October 20th the division landed at Dulag, Leyte. After heavy fighting the 184th Infantry Regiment secured the airstrips at Dulag, the 17th Infantry Regiment secured San Palble, and the 32nd Regiment Infantry took Buri. Operations to secure Leyte continued until February, 1945, when the 7th Infantry Division began training for an invasion of the Ryukyu island chain...which included Okinawa. 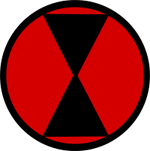 The 7th was now reassigned to XXIV Corps, 10th United States Army, a newly formed command, and began preparations for the assault on Okinawa. On April 1st, 1945 the 7th Infantry Division landed just south of Hagushi, on the west coast of Okinawa along with the 96th Infantry Division and the 1st and 6th Marine Divisions. The 7th moved quickly to Kadena, capturing its airfield, and drove all the way to the eastern side of the island during that first day. After 51 days of battle, the XXIV Corps destroyed Japanese defenses in the southern Okinawan hills. During this operation, the 7th was bombarded with tens of thousands of rounds of artillery fire. The 7th fought for five continuous days to capture the area around Nakagusuku Wan and Skyline Ridge, and also secured Hill 178 in the fighting. Another two weeks of battle found the 7th finally securing Kochi Ridge. Then, after another 39 days of continuous fighting, the 7th Infantry Division was sent into reserve, having suffered heavy casualties. After a short period of rest, the 7th returned to the line, pushing into the Ozato Mura hills where Japanese resistance was the heaviest. The 7th took up a position along the 10th Army's left flank, taking the Ghinen peninsula, Sashiki, and Hanagusuku. On the 21st of June, 1945 the battle for Okinawa ended, with the 7th having seen 82 days of combat. The 7th suffered 1,116 KIA and around 6,000 wounded. They killed somewhere between 25,000 and 28,000 Japanese soldiers and took 4,584 prisoners. The 7th Infantry Division experienced a total of 8,135 KIA during 208 days of combat. Plans for the 7th to take part in Operation Downfall, the final attack against Japan, were scrapped after the Japanese surrendered following the first use of nuclear weapons against the cities of Hiroshima and Nagasaki. During WWII the soldiers of the 7th Infantry Division were awarded three Medals of Honor, 26 Distinguished Service Crosses, one Distinguished Service Medal, 982 Silver Star Medals, 33 Legion of Merit Medals, 50 Soldier's Medals, 3,853 Bronze Star Medals, and 178 Air Medals. The division itself received four campaign streamers and a Philippine Presidential Unit Citation.